Last year I read Tony Kushner's Angels in America and at the end of the year, when I ranked the 10 plays I'd read in 2013, I felt bad to put it at the bottom of my list. I felt bad because I felt like I hadn't given it the focus it deserved. My review, if you could call it that, was based on a lazy, distracted reading. It happens from time to time. With Anton Chekhov's The Cherry Tree, I had a similar experience. I took too long, I lost track of who was who (easier to do when reading a play than watching one). And without ye olde internette to guide me through, I wouldn't have been exactly clear as to what was going on. But I won't take all the blame. I'll admit that the balance of parenting and teaching and now, studying has been a lot to manage and that I was once again a distracted reader. However, when I think back to the life of this blog, I've often had a lot going on. 7 years is going to have a lot of ups and downs, good stress and bad. There have been moves, deaths, changes in careers, you name it. Sometimes those things got in the way of reading, sometimes reading offered a reprieve. The fact that The Cherry Orchard wasn't able to pull me away, to give me a break, should mean something. 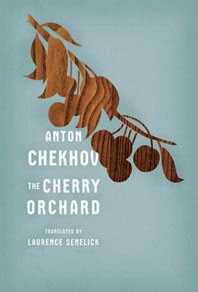 The Cherry Orchard tells of an aristocratic family who can't seem to appreciate the reality that they will actually have to do something to save their family estate, and in the end, they lose it. Apparently Chekhov intended it to be a comedy, but the first director saw it more as a tragedy. I'd have to agree with the director. Arrested Development this was not.